Milorad Dodik, the chairman of Bosnia and Herzegovina's newly-inaugurated three-member presidency, once again stirred controversy in the country after saying that he will use his Serbian passport for his travels abroad. A day after taking the helm at the tripartite presidency, Dodik said: "I have no reason to change anything, I am a Serb. I love Serbia more than I love Bosnia. Bosnia is only my place of employment," in remarks carried by regional broadcaster N1's website. The Serbian nationalist leader called Bosnia and Herzegovina "a failed experiment" earlier on Thursday, saying that Serbs were forced to be in the three-nation federal country. Dodik's passport was issued by Serbia in 2014 when he was serving as the president of the Serb Republic (RS), one of the two legal entities constituting Bosnia and Herzegovina. The pro-Russian politician held this position between 2010 and 2018, in addition to two prime ministry periods between 1998 and 2001, and from 2006 to 2010. The firebrand periodically threatened to hold a referendum on its secession. Last year, the U.S. placed him on a blacklist for undermining the country's peace agreement. In December 2016, Dodik, using his Bosnian diplomatic passport was denied a visa to the U.S., where he was invited to attend President Donald Trump inauguration ceremony. Dodik also called on Serbian politicians serving in the federal level to resign, saying most of them are chosen among his political opponents by his political opponents. 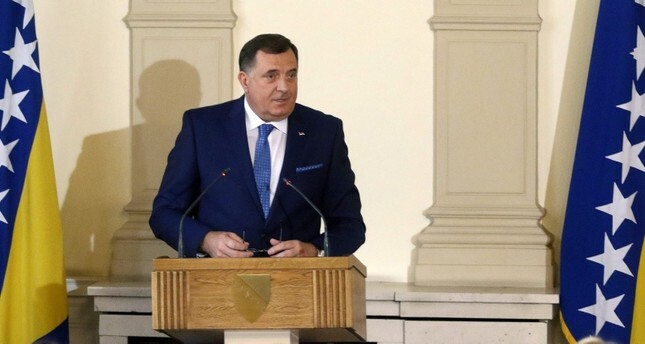 Dodik, who on Tuesday took over the presidency's rotating chairmanship for the next eight months, urged the end of the international presence in Bosnia that was introduced with the Dayton peace accords. "I want us to establish a cooperation that will prove to be effective," he said. "I didn't come here to have my photo taken and receive a salary ... but to help foster an agreement among the two entities and all the citizens of Bosnia." The presidency comprises a Bosnian Muslim (Bosniak), a Serb and a Croat politician. It is part of Bosnia's complex administration established in peace accords that ended the 1992-95 war by creating a Muslim-Croat and a Serb entity joined by central institutions. The presidency members were elected at the Oct. 7 general election. Along with Dodik, Bosnian-Muslim politician Sefik Dzaferovic and Bosnian Croat Zeljko Komsic , considered the only moderate among the three, also took office. In the elections, the Democratic Action Party (SDA) candidate Dzaferovic won 36.6 percent of the votes, while the Democratic Front (DF) candidate Komsic won 52.6 percent of the votes. The Alliance of Independent Social Democrats' (SNSD) candidate Dodik won 53.8 percent of the votes as the Serb member of the council. The members, elected for a period of four years, will serve as the chair of the council for eight months. A bid by nationalists to divide Bosnia along ethnic lines was at the core of the war that killed some 100,000 people and left millions homeless. The ethnic divisions remain alive despite Western efforts at reconciliation. Bosnia's presidency holds little formal power but sets the tone of the country's general policy. It makes decisions by consensus. But disagreements over key issues were already visible on Tuesday — Dzaferovic and Komsic insisted that Bosnia should join NATO while Russia's ally Dodik said the country should remain neutral. A day earlier Dodik had repeated his demands to undo parts of the Dayton Peace Accords, including shutting down the office of the High Representative -- an international envoy that has been sent by the U.N. since 1995 to oversee the peace deal. "My policy is not changing, it's just my workplace that's changing," he said on Monday. Bosnia is seeking European Union membership but bickering among its politicians has stalled the country's advance. While the Dayton Peace Accords that designed Bosnia's power-sharing arrangement ended a devastating war, critics say the system has entrenched communal divisions and hampered effective governance. The country's unwieldy government is further complicated by two separate administrations in its highly-autonomous sub-regions: one for Serbs and one shared by Croats and Bosnian Muslims. Those so-called 'entities' are strung together by weak central institutions. Dodik's elevation to the top office could mark another blow to the fabric of the country. Among ordinary Bosnians, there is little hope for major changes in a paralyzed political system that has allowed corruption to flourish and stalled economic reforms for years. Unemployment affects up to one-third of the country, where large numbers are migrating abroad for work.